Hi! I’m SARAH ANDRE, a speech pathologist turned romance writer. I’ve also been a travel agent, rooms control supervisor at a Marriott convention hotel, a rep in mutual fund customer service and cold call sales. In looking for my passion, I stumbled upon it quite by accident. Just before boarding a plane for a trip to Italy in 2004, I bought a spiral notebook. I do not recall any conscious thought of “I am going to write a novel.” (Insert angels trumpeting.) 🙂 Just bought it and got on-board. As soon as the plane took off I opened that notebook and out flowed pages of a story, as if it had been in me forever and was finally released! Passengers slept those eight hours and I wrote by the tiny seat light–just me and one lone flight attendant left awake. I named my first hero after that flight attendant. I remember in second grade, standing beside my parents while my teacher said, “Sarah will be a writer. She knows the structure of a story, which is unheard of at this age.” And she proceeded to show them a story I’d written of a girl in danger who climbs a tree and gets stuck. A German Shepard climbs up and rescues her. The End. The pages I wrote on that Italian trip did turn into my first romance (still my husband’s favorite and he reads all of my books.) However this story is what we writers call “a starter novel.” It’s the book buried underneath my bed never to see the light of day. But boy did it ignite my passion! 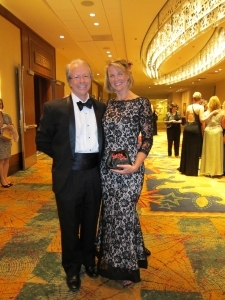 2014 RWA Awards Night with husband, Scott. I joined RWA in 2005 (still appalled that I wrote romance, this was not what I’d planned with all my daydreams of being a writer.) My second novel captured the attention of my agent in 2009, and she tried unsuccessfully to sell it to the NY traditional publishers in 2010. In 2011 I was a Golden Heart finalist, the most prestigious award for unpublished writers. My third novel gave me another Golden Heart final in 2014, and that was the year I signed with Entangled Publishing to debut Locked, Loaded and Lying. And the rest is history! 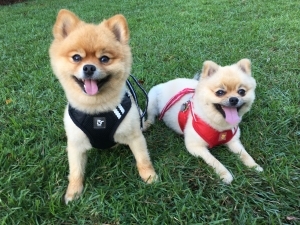 Nowadays I live in serene Southwest Florida with my husband and two naughty Pomeranian boys: Bo and Taz. I love yoga, reading, exercising to loud alternative rock and a whole lotta silence to daydream! Sarah's newsletter is for announcments, like book releases, while site news keeps you up to date with everything going on in the Sarah Andre World. Sign up for whichever kind of news you want, or both! Thanks!